Jill Schramm/MDN Kathy Tweeten, left, and Dina Butcher, with North Dakotans for Public Integrity, were in Minot Wednesday to promote Measure 1. Proponents of an anti-corruption constitutional amendment say transparency and accountability are the intent behind Measure 1 on North Dakota’s Nov. 6 general election ballot. Opponents say the measure’s language would put a reporting burden on citizens or nonprofit organizations that could discourage public involvement with their government. “To have a democracy, you have to have transparency. This amendment does that,” said Kathy Tweeten, treasurer with North Dakotans for Public Integrity. 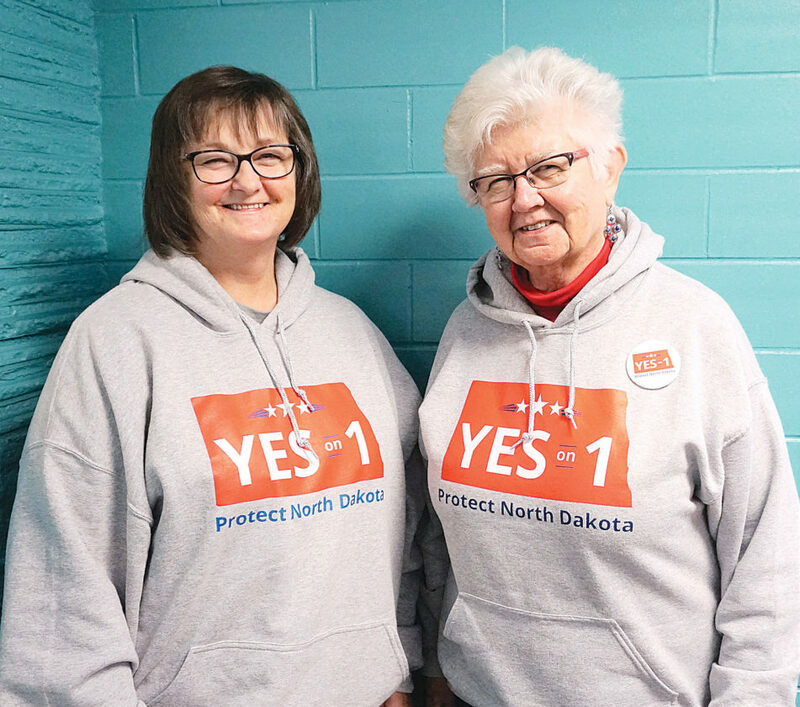 Tweeten and Dina Butcher, a former lobbyist and president for the group promoting Measure 1, were in Minot Wednesday to discuss the proposed amendment. North Dakotans for Public Integrity has been showing the documentary “Dark Money” around the state and plans a showing in Minot next week. The date and location are to be released soon. “Dark Money” is a 2018 documentary about the effects of corporate money and influence in Montana. Butcher said there is concern about lobbyist influence in North Dakota, particularly with the increase in activity from oil development. “We want to put a brake on it a little bit – at least know where the money is coming from that’s influencing our legislators,” she said. Measure 1 requires prompt, online disclosure of all spending over $200 to influence elections and government and bans spending by foreign entities. It restricts lobbyist gifts to public officials, bans lobbyists from serving as legislators, strengthens conflict of interest rules and requires public officials to wait two years after leaving office before becoming lobbyists. The measure would set up an ethics commission to create rules, maintain a whistleblower hotline, investigate reported violations and serve as a resource. The commission would consist of five members, appointed by consensus agreement of the governor and the Senate majority and minority leaders. Commissioners cannot be lobbyists, candidates for public office or political party officials. Butcher said the commission would have to follow the same rule-making procedures as state agencies, including seeking public input. A legislative committee would review the commission’s activities and the Legislature will determine funding and any implementing legislation, she said. The measure gives the Legislature three years to fully implement the requirements of the measure, she said. Tweeten and Butcher, who have both held public employee positions, said incidents have occurred that point to a need for a greater focus on ethics and lobbyist reporting. North Dakotans for Public Integrity this week released an analysis of lobbyist expenditure reports from 2017 and 2018 that showed of 501 registered lobbyists, only 3 percent in 2017 and 9 percent in 2018 reported spending at a level requiring reporting. The requirement kicks in with an expenditure of $60 or more per occasion or per elected official. The organization stated the analysis found no consistency among lobbyists in what gets reported. Measure 1 has drawn opposition from diverse groups ranging from the Greater North Dakota Chamber to ACLU of North Dakota. Christopher Dodson, an attorney and executive director for the North Dakota Catholic Conference, said the measure injects barriers to civic and public participation into the political process. In speaking out on public policy, the Catholic Conference would need to disclose the thousands of names of people who have donated to a diocese, Dodson said. When Catholic Charities negotiates contracts with state governments to provide guardianship or adoption services, those negotiations could be interpreted as influencing state government, triggering a requirement to report the names of all donors to Catholic Charities, he said. Dodson said regardless of the amount an individual donor contributes to a charity, their names would have to be revealed if the charity spends at least $200. Spending that amount on travel to Bismarck would trigger the reporting requirement for an organization, he said. Measure proponents disagree that a citizen’s travel expense to attend a legislative meeting is a lobbying cost. “I don’t know where they are coming up with these hypotheticals but they are pretty ridiculous,” Butcher responded. She said the extent and details of who and what must be reported would be set by the Legislature if the measure passes. Opponents disagree, saying the wording of the measure requires the Legislature to include broad language in its implementation. Dodson said the current spending reports by registered lobbyists are few because the existing state requirement to register as a lobbyist covers many people who do not spend money to speak on behalf of groups. The Catholic Conference is speaking out independently against Measure 1, but a coalition called North Dakotans for Sound Government is actively campaigning against the measure. It lists energy companies and other business groups among its financial supporters. North Dakotans for Public Integrity has in-state donors but also a number of out-of-state donors, with the largest donations from Represent Us and Voters Right to Know. Represent Us promotes anti-corruption measures across the country, and Voters Right to Know is a national coalition formed to advance state-level policy surrounding transparency in political spending.